There is nothing worse for the image of urban agriculture than weedy, ramshackle gardens decorated with random piles of mulch, crooked sticks lashed together, the orange twine from bales of straw serving as trellises and plastic pots stacked haphazardly in the corner. This is all too often the face that we see of urban farms and community gardens, and an area that the professional designers have the power to improve. The message to urban farm managers is that good aesthetics sell—they help to sell the product, but just as importantly, they help to sell the concept to the public. The message to designers is that urban farmers and gardeners generally don’t conceive of their space as part of the urban fabric in the way that we do, and it’s an understanding that can’t be forced on them. Rather, success in this regard has to be addressed in two different ways: 1) at the outset, with the design that the farm manager will inherit as their workspace; and 2) through the development of management protocols that will uphold the integrity of the design over time. It is crucial, however, that both aspects be carried out with full comprehension of the farmer’s reality. The designer’s role, of course, is to put some architecture into what is essentially a ‘working’ landscape. Edible species tend to look shabby at certain times of year, but if framed by a well-designed bed, this is less of an issue. It’s easy for a landscape architect to design a stunning garden layout framed with high-end hardscaping and highlighted with any number of the bells and whistles of contemporary design, but if it’s just a showpiece it will inevitably become underused, unclaimed by the community and labeled as pretentious. The point of an urban farm is to produce food, which means designing for the practical needs of the farmer and other potential users. That’s a general tenet of good design, but it looks very different in this context than in a park or an office complex. Stephen Prassas, ASLA, a landscape architect in Peter Schaudt’s firm at the time the Gary Comer Youth Center rooftop garden in Chicago was designed and built, recently shared with me some of the small ways that this played out for them. This was a place for youth to learn about gardening, so it had to be kid-proof. For example, they added a layer of rigid plastic mesh under the soil to protect the roof membrane from overzealous diggers. Drip irrigation was ruled out for fear that the kids would wreak havoc with the tubing and sprinkler risers were installed instead. Plus, the lightweight soilless mix used for roof gardens doesn’t wick very well, which is important for even moisture distribution from a drip system. However, the architect of the building stipulated that the soil level had to be flush with the path surfaces and that the bed widths had to vary according to the spacing of the windows that looked out onto them. Aesthetically, these features were brilliant, but neither turned out to be very popular with the garden manager who found it quite an awkward design to work with. Nonetheless, it has been a very successful project overall in meeting the needs of its users and has served as an ambassador for the urban agriculture movement. When it comes to food-producing landscapes, ideally, the site manager is involved throughout the programming and design process as a primary stakeholder. These landscapes are even more maintenance-intensive than botanical gardens and cannot be treated as ordinary landscaping. If the site manager is involved in the design process, they are likely to be more amenable to adopting maintenance protocols that are not directly related to food production. 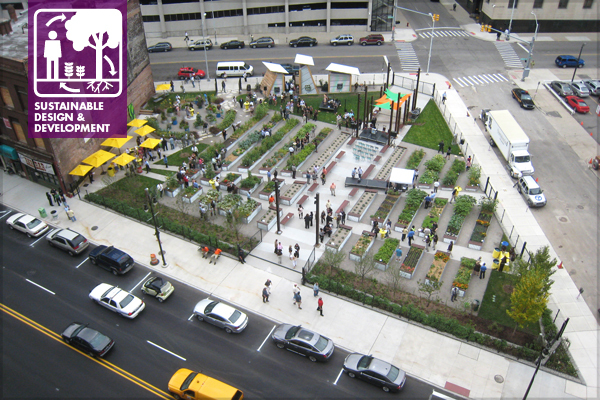 Ken Weikal, ASLA, and Beth Hagenbuch, ASLA, recently gave me a simple example from Lafayette Greens, an urban garden that has become a thriving community hub in downtown Detroit since it was put in several years ago. They learned how important it was that the gardener be instructed to put down a tarp whenever they were working in a particular bed. Otherwise the path surface slowly become degraded by all the bits of soil falling into the gravel. This might be standard practice for a professional landscape crew working in a high profile setting, but for someone simply consumed with keeping crops healthy and productive (usually while attending to the needs of the volunteers and visitors that urban farms tend to be inundated with) it is not an automatic response. That being said, the growing demand for designed food-producing landscapes is already spawning a hybrid form of landscape professional who is equally familiar with the precepts of conventional maintenance and the horticultural requirements of edible species. Besides the key aesthetic and functional contributions designers can offer to the movement, we also have a crucial role in ushering these projects through all of the pre-development hurdles of a fiscal, regulatory and programmatic nature. 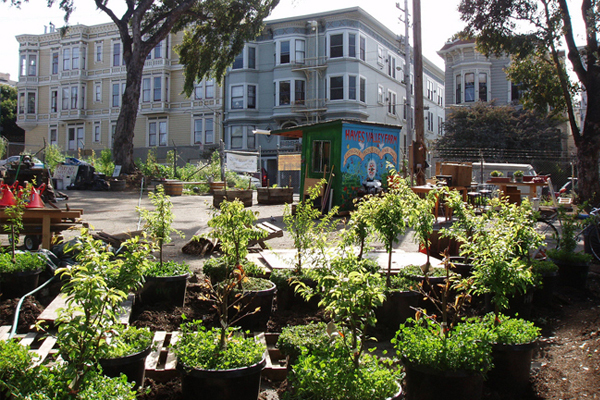 Designing publicly accessible spaces involves liabilities that urban farmers are not equipped to address. Safety and security are a huge concern in environments that are apt to include rototillers, pitchforks and beehives. There are health code implications that have to be considered wherever food is involved. 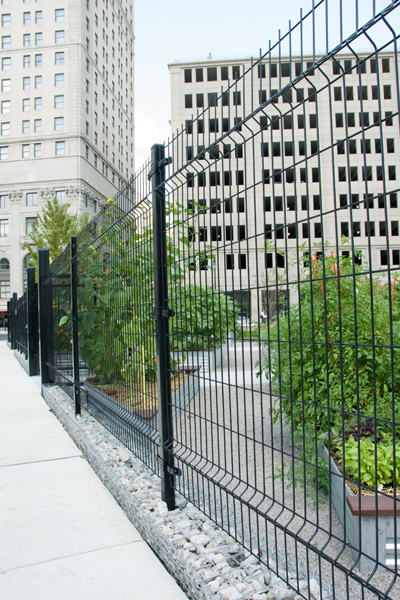 Many community gardens are secured with chain-link fencing, steel chains and padlocks, but landscape architects have the capacity to work out fencing or wall systems that do the job and enhance the civic presence of the site, rather than diminish it. At Lafayette Greens, Ken and Beth used a 5-foot tall black mesh fence that is very difficult to breach, yet feels light and unobtrusive and visually recedes into the foliage. Then there is the question of cost, always the biggest sticking point. 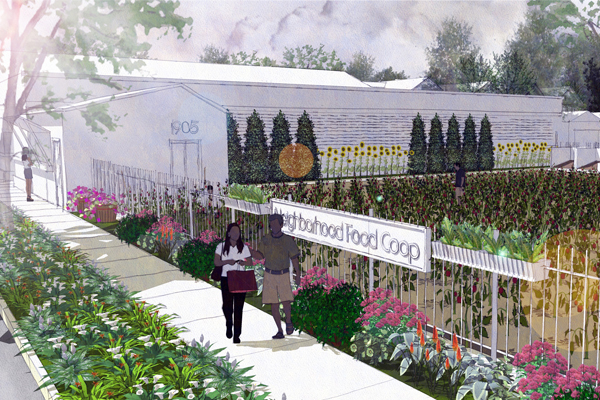 Community gardens and urban farms typically lack professional design because of the perception that it costs more. It’s true, it does cost more, but the point is that it should pay for itself and then some. In a rural context, a farmer has to pay for the land, water system, storage structures, etc., as well as labor, through the income from goods sold. There are examples of urban growers grossing upwards of $100,000 annually per acre, but even so, urban agriculture is not economically viable through the sale of produce alone if land costs, good quality infrastructure and the soft costs involved in land development and design are included. The only way it works is as a value-adding amenity to a larger development—exactly what landscape architects are accustomed to. 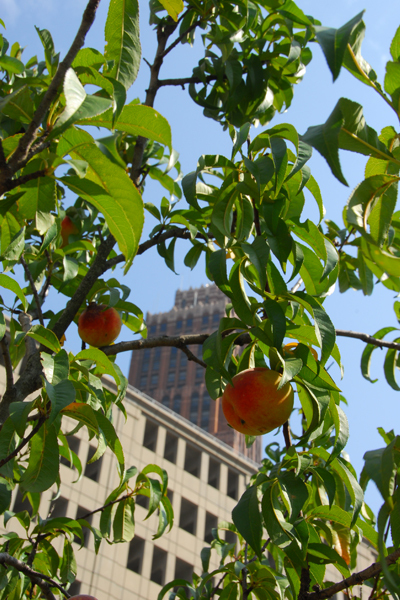 More and more developers are considering farms, rather than golf courses or exercise rooms; forward-thinking corporations see food gardens as part of the high-quality work environment they want to offer to their employees; and academic institutions increasingly view urban agriculture as part of their sustainability-themed master plans. Where food-producing landscapes can pay for themselves with produce sales is in the extra cost that goes into the maintenance line of the budget for operating expenses of the facilities they are a part of. Landscape architects know how to navigate the administrative landscape of land development and can use this knowledge to enable greater urban food production and all the benefits that it brings to a community. Still, this unique context means there are many details to consider, skills to master and a lot of creativity required to usher this novel form of land use into urban systems that are not always immediately receptive to it. There are so many small things to consider—refrigeration, for example. Produce needs to kept cool, but walk-in coolers are not in the repertoire for most landscape architects and can easily be overlooked. Ken Weikal told me how he specified hoses of a certain length for Lafayette Greens that when connected to any of the hose bibbs available in the garden were not long enough to reach across any of the primary pathways. He didn’t want to create a tripping hazard for pedestrians and knew that he couldn’t rely exclusively on the garden manager to think of such things. 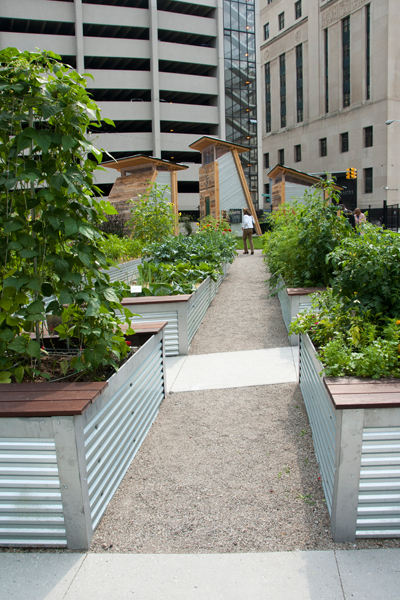 Above all, urban agriculture design needs to be practical for its intended purpose. Perhaps the only thing worse than an overgrown food plot with a crooked chain link fence around it is an over-designed edible landscape—too perfect, too conceptual and wholly impractical for growing food. The point is to touch, taste and experience the fruits of the earth, not just to look. In some ways farming is the antithesis of landscape architecture, at least the artistic part of it. Yet farmers also see their work as an art form, it’s just more experiential than visual. By refocusing the lens of landscape architecture to see food production as one of many landscape functions—alongside stormwater management, microclimate moderation, habitat restoration and beautification—our cities can become even greener and more resilient. by Brian Barth, Affiliate ASLA, a writer and consultant with a background in urban planning, landscape design and sustainable agriculture. He holds a Master’s Degree in Environmental Planning and Design from the University of Georgia and is co-founder of Urban Agriculture, Inc., a full-service planning, design, and project management firm. This article is great. It illuminates a common misperception of urban farms by non-farmers that’s helpful for landscape designers to keep in mind. Urban dwellers often aren’t knowledgeable about the natural cycles of plants in nature. The nature they are familiar with consists of ornamental plants chosen for their horticultural characteristics to thrive in that particular climate, which are on constant irrigation and fertilizers, and are designed to bloom at alternating times throughout the year so that the garden always looks colorful. Lacking an appreciation for natural landscapes due to their experience only with manmade landscapes, urban dwellers may judge a native plant landscape or a food-producing garden as “ratty” or “not maintained” or “ugly” because they see brown branches, random bare patches of ground, chain link fences, or a lack of formal structure. As designers, we need to be understanding of this and plan for it by keeping in mind the ideas discussed in this article. We can design colorful companion flower and foliage beds alongside seasonal veggies or native beds that go brown in summer. We can spec aesthetic, farm-functional fencing and structures that also serve to hide tools, bags of mulch, and other clutter. We can talk with farmers up front about their needs for storage and the most logical locations for it, then build sheds, bins, compost piles, shade structures, and mini-farm stands into our designs so they aren’t tacked on later in a haphazard way. And street frontages can be more formally designed to create a comfortable transition from engineered hardscape and pedestrian zones to the wilder, less-structured areas of seasonal vegetables and natives. Once the community gets used to the presence of a neighborhood garden, educational outreach and event programming can help people learn more about natural cycles so they can appreciate why a healthy ecosystem sometimes looks a little messy.